In this article we will explore three such behaviors that might just come in handy to protect your dog. The training methods for all of these “tricks” are easy and fun. When you can structure training as a game, you will be surprised how motivated your dog is to learn, and how quickly they pick up new behaviors. Professional dog trainers use the term “recall” to refer to when your dog comes when called. Training a strong recall could save your dog’s life. 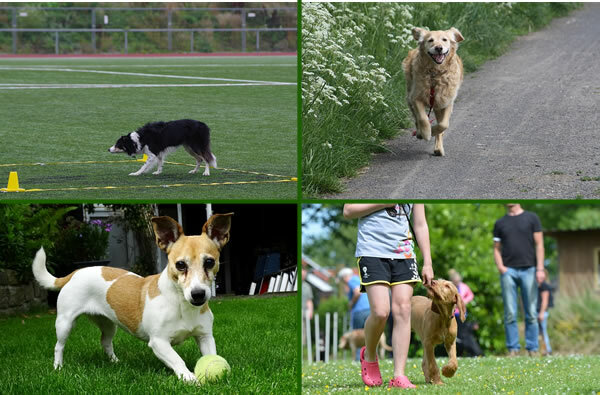 If they get loose on a walk or get out of the fence, being able to get your dog back in a hurry can keep them out of all sorts of trouble – sometimes even preventing injury or worse. The best way to teach a great recall is to make a fun game of it in a low distraction environment. If you have a few people (kids are great for this), start in a circle and alternate calling the dog, followed by giving them a treat or other reward and plenty of praise. You can raise the bar once your dog understands the basics by spreading out into different rooms in the house to make this game more challenging. Once your dog has a great recall in a familiar environment, you can start to practice calling them to you outside. If you do not have a fenced in area to work with, try using a very long rope or leash while playing a recall game safely outdoors. Never call your dog to you and then punish them. Always praise them when they come to you when called. Do not call more than once. Instead of calling again, run away and act like it is a game of chase. Reward them for coming, even if late. Over time, selectively raise your criteria and reward only for the fastest recalls. Practice recall often and in as many environments as possible. It is not unusual for dogs to get into things they are not supposed to, and being able to get them to let go of something in a hurry can be another lifesaving skill to have on command. The first stage of teaching “Drop It” is to train your dog that when they give you this, they get that. In other words, you start by trading with your dog. It is important that you follow a few guidelines when training this command. Always give your dog a treat that is of a HIGHER value to them than what they are giving up. Only TEMPORARILY take away the item, give the reward and some praise, then give the original item back. Start adding distance until your furry friend is reliably dropping the item even when you are far away. If you follow the above guidelines your dog will quickly and easily learn that when they give up something on command, they not only get to keep their item, but they get an extra something good to boot! Dog trainers often refer to a concept called “impulse control.” This means that your dog learns that they cannot always get what they want right this instant, but if they are patient, good things will come to them. There are a variety of games that fit under the category of impulse control. “Stay,” “Go to your mat,” and “Kennel Up!” are all ways that your dog can learn to defer their own instant gratification for the chance at a bigger delayed reward. Put a small piece of food your dog loves on the floor and cover it with your hand. Your dog will probably nose around your hand to try to get at the treat. Just wait it out until they give up, even for an instant. At that time say “Okay!” and let them have the treat. Continue adding a little time before the release word until your dog has mastered this trick! When you keep training positive and fun for your dog, you will find they look forward to learning. Giving your canine these important safety behaviors is a way of giving them critical life skills for living in a sometimes dangerous world. We hope this brief tutorial inspires you to work on these (and other) behaviors with positive training methods! Mat Coulton has worked with dogs for just under a decade and is the founder of http://www.wileypup.com/ a doggy lover’s website that provides great tips and advice for paw parents everywhere. Thanks for the blog post, Mat. Blue Belle loves to learn. When we adopted her, she already knew many of the commands and we continue to teach her new things. – Julie, Murry, and Blue Belle. This entry was posted in Dog Training, Guest Blog and tagged dog, training by admin. Bookmark the permalink.